This pair of bridges was erected in 1912 by the firm of Spencer & Co. of Melksham in Wiltshire to replace a rolling drawbridge placed there by the Midland and Great Western Railway Company in 1860. Sir John Purser Griffith, Chief Engineer of the Dublin Port and Docks Board, based his design on that previously patented in 1893 by William Scherzer of Chicago. 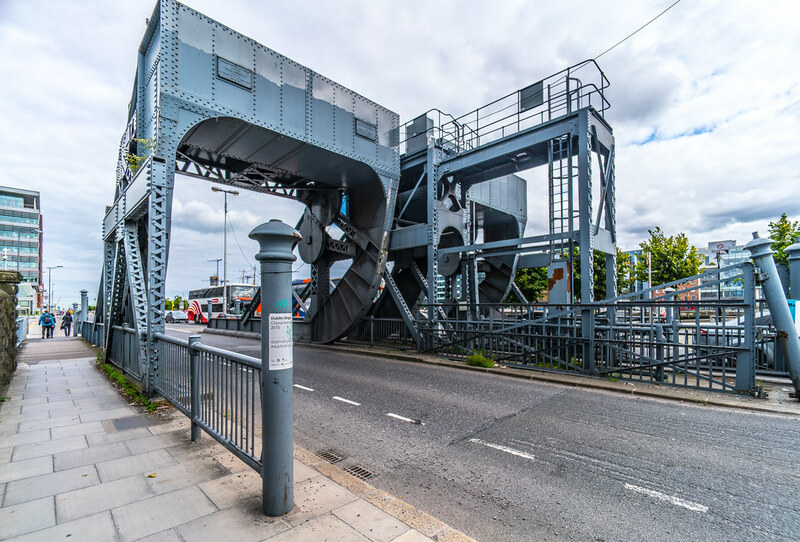 A similar pair of bridges was erected by Sir William Arroll of Glasgow in 1932 over the entrance to the Custom House Docks further up river Liffey. Each bridge consists of two main girders connected together by 14 floor beams, the floor been composed of patented “buckled plates” (an invention of the Irish Engineer, Robert Mallet) resting on and riveted to the floor beams and to the joists fitted between the floor beams. To the western ends of the main girders segmental girders are attached to form the rolling surfaces upon which the bridges bear. The segmental girders are extended so as to carry a large counterweight and the whole structure is suitably braced. To prevent accidental displacement of the bridges on their paths, teeth were formed on the cast steel track plates, and corresponding recesses cut and accurately tooled in the curved track plates of the segmental girders. Each bridge was worked by an electric motor (now removed) , erected on a platform in front of the counterweight box, they could be operated manually in case of power failure.